The climate of Nanchang is temperate, with relatively cold winters and hot, muggy and rainy summers. Nanchang is the capital of the Jiangxi Province and is located in southeastern China, at a low latitude (at the 28th parallel), but also in a large continental area, and 450 kilometers (280 miles) away from the sea, so the summer heat is intense and annoying, while in winter, cold air can stagnate on the ground. Nanchang is a city with a millennial history, but today it is a metropolis, polluted as often happens in large Chinese cities. Precipitation is quite abundant, and amounts to 1,615 millimeters (64 inches) per year. We can notice a minimum between autumn and early winter, and a clear maximum between spring and early summer: more than 200 mm (8 in) of rain per month fall between April and June. Here is the average rainfall. Winter, from December to February, is not very cold on average, in fact, the average January temperature is 5.5 °C (42 °F). However, there may be cold periods, with temperatures remaining around freezing even during the day and with possible snowfalls. At other periods, subtropical air masses prevail, so much so that the temperature becomes decidedly mild, around 20 °C (68 °F) during the day. Sunny days are a bit more frequent in December, then they become rarer. Spring, from March to May, is initially mild, and then becomes gradually warmer, but it is also decidedly rainy. In May, there are already several warm and summer-like days, at least as regards to the temperature. Summer, from June to September, is decidedly hot and muggy. The distance from the sea and the humidity make the heat sweltering, especially in July and August. June is a very rainy month and there's not much sun, then the weather gradually becomes more stable, but on sunny periods, it can be very hot, especially in July and August, with peaks around 36/38 °C (97/100 °F) and tropical nights. Autumn, in October and November, is initially mild, and gradually becomes cooler, and then quite cold at night by November. The rains are not very frequent: autumn is the least rainy season of the year. 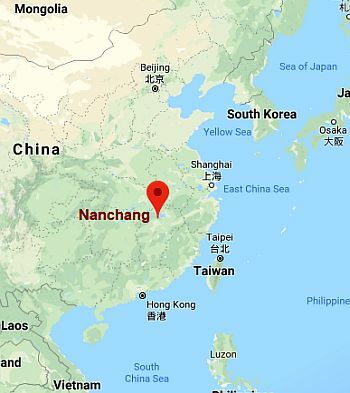 On average, the amount of sunshine in Nanchang is never very good; however, it is quite good in July and August, while it is low (with a percentage equal to or less than 30%) from January to April. Every so often, from June to October, typhoons, the tropical cyclones of Southeast Asia, which most easily affect the coastal areas, can penetrate the mainland, even though they arrive in this area decidedly weakened because of the distance from the sea. To the north of the city lies Poyang lake, the largest freshwater lake in China, which is fed by five rivers (including the Gan River, which crosses Nanchang) and is famous not only for being the habitat of a large number of migratory birds but also for having swallowed a large number of boats and people over the centuries. The lake is affected by the rainfall level, and risks disappearing during the driest winters, also because of the Three Gorges Dam, which was built upstream on the Blue River (Yangtze) and was completed in 2006. 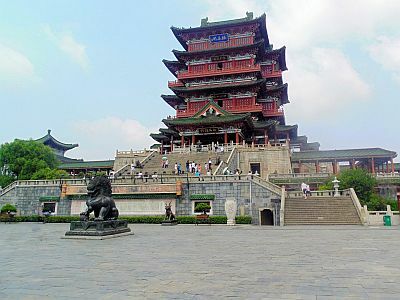 It is not easy to find the best time to visit Nanchang. Being that the spring is very rainy and with little sunshine, you can choose autumn, especially from late September to early November, since it is the least rainy period of the year, and it is generally mild or pleasantly warm; it must be said that the arrival of the remains of a typhoon can not be excluded.